In my opinion, when you want a quick but satisfying meal, grilling up some panini are the way to go. There are some foods that are just comforting and a hot sandwich is definitely one of them. PLUS, as I often mention, I LOVE when I can vary my favorite types of foods up. 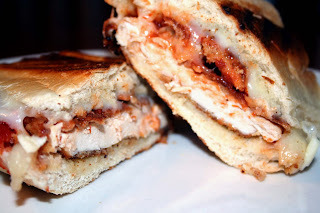 I love panini sandwiches, and I love Chicken Parmesan so I'm surprised I haven't made Chicken Parm Paninis more often. This is a *little* more time consuming than most paninis I make, however the results are totally worth it. And, I stress a little because it's still not too much more time consuming in all honesty. Butterfly the chicken breasts and cut each in half. Pound to even thickness, about 1/4" thick and season both sides with S&P to taste. Heat Olive Oil in a deep skillet over medium heat. Place the breadcrumbs and Parmesan cheese in a shallow bowl and stir together. Whisk together the eggs and water in another shallow bowl. Put the flour in a final shallow bowl. Dredge the chicken in the flour, shaking off the excess. Dip the chicken in the egg mixture, dripping off the excess and then place the chicken in the breadcrumb/cheese mixture, pressing to allow crumbs to adhere. Saute the chicken pieces in the skillet and fry, turning once until golden and crisp, about 5 minutes total. Place 1 piece of chicken on the bottom of each segment of bread then top with 1/4 cup tomato sauce, 1 slice of cheese and some fresh basil. Cover with the top half of each bread section. Place 2 sandwiches in a preheated panini press and cook until the cheese is melted, about 3 minutes. Transfer to a cutting board to cut in half for serving. Repeat with remaining 2 sandwiches and serve immediately.